SAN FRANCISCO – The Japanese Cultural and Community Center of Northern California celebrates the publication of “From Both Shores” at a book launch on Sunday, Nov. 23, at the JCCCNC, 1840 Sutter St. in San Francisco Japantown. Books will be available for purchase at $14.99 each, signing, and readings will be given by San Francisco poet Genny Lim. 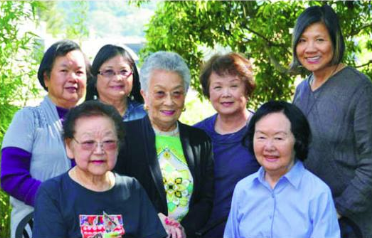 “From Both Shores” is a collection of short memoir stories and poems written by seven senior Japanese and Chinese American women, who chronicle their immigrant families’ journeys through hardships and triumphs from their respective motherlands of Japan and China to America. The authors are Daisy Satoda, Harumi Serata, Florence Dobashi, Brenda Chinn, May Chung, and Leslie Yee-Murata. Their moving accounts, edited by Lim, bear witness to the harsh realities of ordinary working-class families forced to leave their war-torn countries and poverty in search of new lives in America. They shed light on an infamous chapter in American history when Japanese Americans were incarcerated in concentration camps during World War II. Having lost their land and possessions, the challenges of piecing back their lives remained, for the most part, an untold chapter. Chinese Americans, on the other hand, suffered discrimination from the Chinese Exclusion Act of 1882, which wasn’t lifted until 1943, two years before the end of the war, when the Japanese Americans were released from the camps. Their contrasting portraits reveal the common threads as well as the differences between the Chinese and Japanese American experiences at different times in U.S. history. They represent first- and second-generation accounts of the impact of politics and war on families from two different perspectives. Lim is a prize-winning poet and playwright who wrote the historical drama “Paper Angels” and co-authored “Island: Poetry and History of Chinese Immigrants on Angel Island” (Lai, Lim & Yung, 1980, 2014, University of Washington). “From Both Shores” was funded by the Cultural Equity Grants’ Artists in Community Partnerships Program under the San Francisco Arts Commission and Poets and Writers.